The Sharp AQUOS Crystal Smartphone reminds me of a tiny TV. The crystal clear screen feels like I am watching a miniature version of our HD TV. I participated in an Influencer Activation Program on behalf of Influence-Central for Sprint. I received a sample device to facilitate my review. As a blogger, I always check the camera on phones right away. Instead of lugging my big DSLR to events, I prefer to have a reliable smartphone camera. 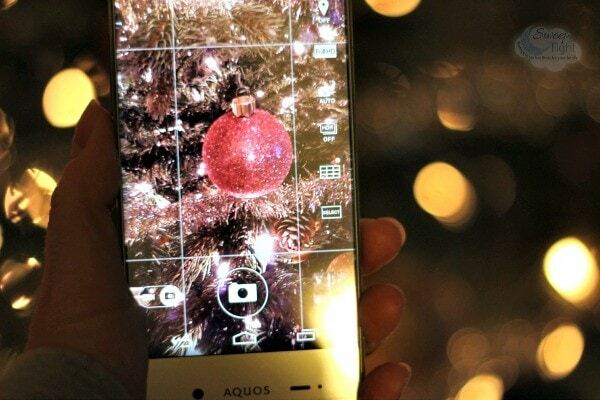 The Sharp AQUOS Crystal has a ton of options for taking pictures. There are advanced photo features like “Night Catch” that will brighten the subject and background for nighttime shots. I haven’t yet explored all of the photo options that are available. 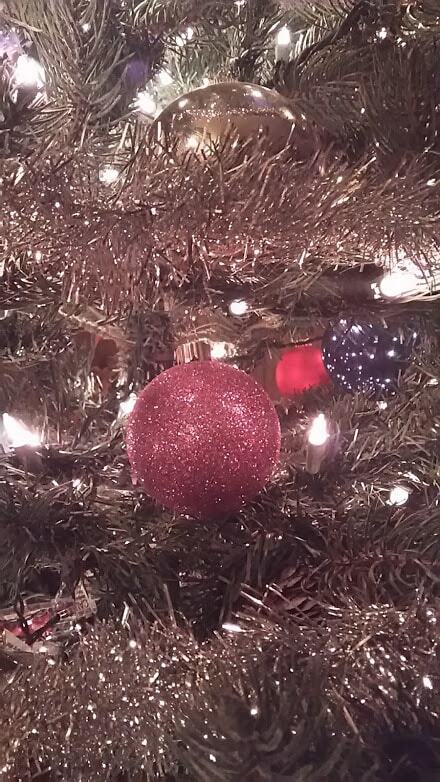 I took some pretty good ones of our Christmas tree. If you don’t feel like messing with special settings every time you snap a photo, you can just put it on auto. You can even set it to automatically take a photo when it detects a smile. That could make for some great candid shots. Have you ever heard of Wi-Fi calling? I hadn’t before this. The Sharp AQUOS Crystal allows users to use their voice and messaging services over existing Wi-Fi networks. I tried it out, and the clarity of the call was the same. I didn’t notice any difference. This feature could allow us to decrease our data plan into a less expensive package. Pretty sweet. The phone is loaded with all of the Google applications like, Google Search, Google Maps, Google Navigation, Google Talk, Google Calendar, Google+, and YouTube. All apps that I use quite frequently. Thanks to the TV-like screen, I will now be streaming videos a lot more often, as well. That is if Mike doesn’t steal this phone from me. He’s already tried to! There are many other features that I could mention about this phone. Clip Now is one more fun one. It allows you to take screenshots with one swipe and saves them with an embedded URL for easy sharing. Sharp AQUOS Crystal runs on the Sprint Spark network, which enhances the phone’s LTE service and allows for high-quality streaming. As I mentioned in my last Sprint post, the Chicago network has dramatically improved. I am finding that Sprint is once again a reliable network to have in the area. Find out more and purchase a Sprint AQUOS Smartphone here. The Sharp Aquos Crystal Smartphone looks like it has great features. It keeps getting better and better. This is really a great little phone. It would be wonderful to have. Looks like a great phone. Mine just makes calls. 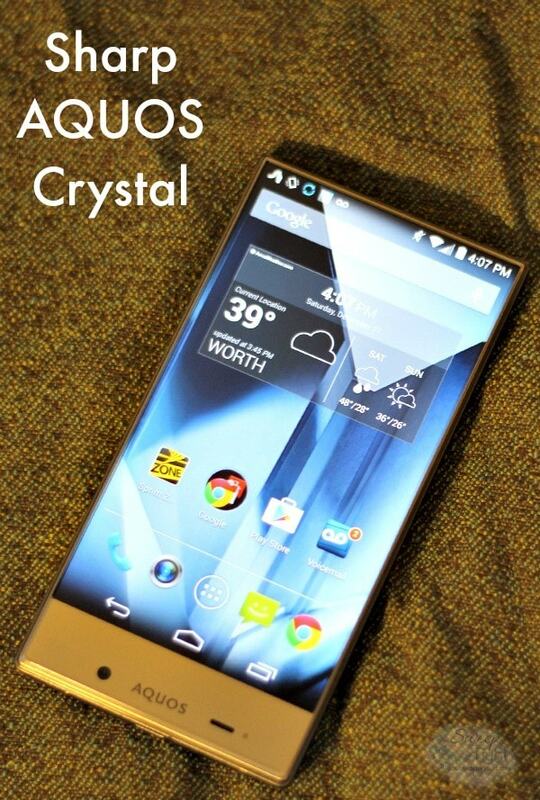 The AQUOS Crystal Smartphone looks great the image is very sharp. I don’t really use my phone for anything but making calls, if I used my phone for internet activity I would definitely update to the Sharp AQUOS. Thank you for sharing this review. Clear picture means so much to me. Maybe it’s my age (but I’m not that old!) but so far watching videos on my phone hasn’t seemed very enticing. 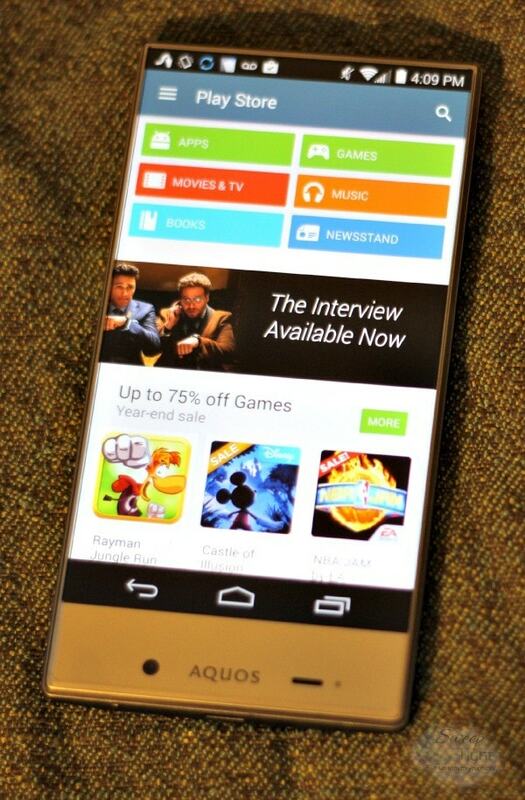 Maybe the The Sharp Aquos Crystal Smartphone is the way to go. This looks like a really fun phone! Too bad the Sprint Network doesn’t work well in my neighborhood. This Sharp Aquos Crystal takes very good pictures for being a phone. 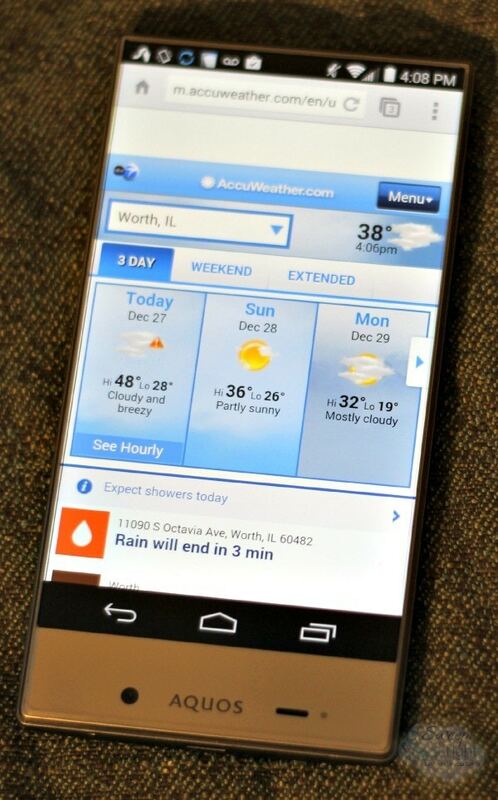 I like how nice the weather looked on your phone and this is a smartphone that I would love to try! I havent seen this brand before but it looks quite nice. I like the screen size and it looks very sharp o the display. I’ve never heard of the Aquos brand before. This phone does sound really great though! What a sweet phone. I ma an iPhone girl for life, but would consider getting this for one of my kids someday. Looks like this phone takes great photos. Never heard of it but worth looking into. I love the look of this phone, it looks so sleek! Maybe when my contract is done, I’ll consider getting this one. That is so nice that the screen goes from edge to edge. I think that is such a great feature- wish my iPhone had it! The camera looks like it takes awesome pictures, which is great. Wi-fi calling pretty much sounds like FaceTime audio to me! Very interesting. I haven’t heard of this phone yet. I’ll definitely have to check it out. I’m due for a new phone in February. Thanks for the information! Pretty cool features. I would love an alternative to taking my DSLR cam everywhere I go. It’s heavy and bulky. Wow I had no idea about this phone. It looks and sounds great. As my kids grow and want phones I think this could be a great choice! I don’t know much about phones but it looks great! I’ve never seen this phone in the UK, which is such a shame. I love the night catch. Clear photos are so important and having a small device that does the job is brilliant. I’ve seen Sharp TVs before (I may even have one) but I didn’t know they made smartphones. That’s a gorgeous screen! That SmartPhone looks really nice. I have been thinking about upgrading. I may just have to get this one. Thanks for sharing. Wow! I wish my point and shoot got pictures like that. Those are pretty daggone cool! The picture on that phone seems incredible! It looks like you could jump right through the screen! I have just recently heard about wifi calling and I like the sounds of it! This is the first time that I’ve heard about this product…and the brand name. 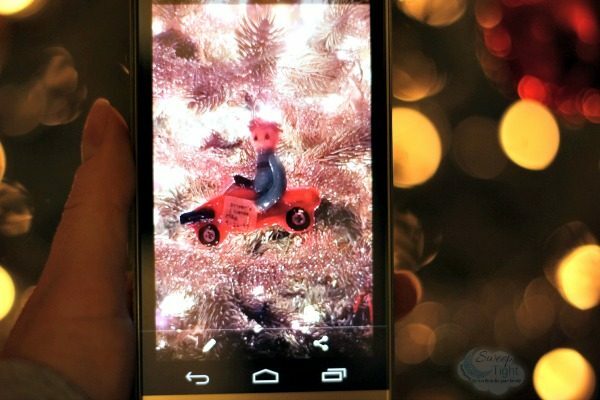 I am truly impressed with the photo of the lit-up Christmas tree and bulb. It certainly has cool features. And no, I’ve never heard of wi-fi calling until now. Thanks for the info. I’ve been looking into a new phone for some time, I love the quality of pictures this phone can take, and having Google features and streaming capabilities just seems like a must these days. The photos you took were fantastic! I will have to check out the price on this phone. Great features on this phone and I love the size and how it is thin, looks like a mini flat screen tv in the palm of your hands.